Designed for pore structure characterization of materials such as hollow fibers, flat sheet membranes, filter media, ceramics having very small pore sizes. It is capable of measuring pore diameters, pore size distributions and liquid flow rates of materials having very low permeability. 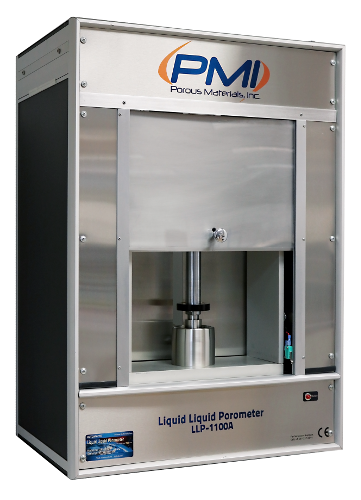 The Liquid-Liquid Porometer uses two immiscible & saturated wetting liquids with low interfacial tension. The selection of low interfacial liquids allow to measure open pores down to 3 nm at relatively low pressures. The pores are filled with a first liquid and the second liquid is pressurized to displace the first liquid and flow through the pores. The amount of liquid flowing out is measured. Then the second liquid flow rate and differential pressure are measured. The pore distributions are computed similar to a capillary flow porometer. We would be pleased to advise you personally about your questions.